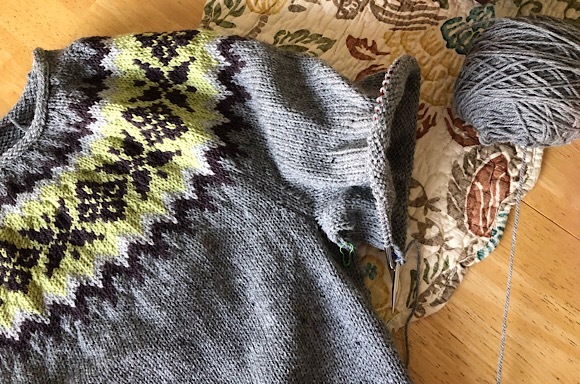 I'm on the first sleeve of my fair isle sweater. I love working on this project and will be a little sad when I'm done. But I'm not done so I'm still happy! My son's blanket is growing as well. I achieved a great photo with the iphone instead of the big camera. Maybe the sun peeking out today helped a bit in my shadowy house. I'm in the last 200 pages of George Washington. I've enjoyed this book immensely however, it's a dense read and each sentence is dripping with information so it takes awhile to get through. I do recommend this book if you want to learn more about the first president and the beginnings of the United States. Earlier this week I started reading March and so far I like it. I've read one other of Geraldine Brooks (can't remember the title!). 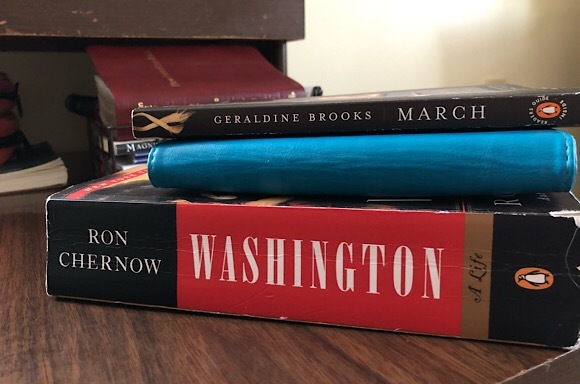 Her writing flows and the research she does for historical fiction shows. Another great book and writer that I recommend. On my Kindle I'm reading The Great Alone and so far it's 'okay'. I keep hoping it gets better but it's not getting worse so I keep reading. I don't think my sister liked the book or the ending so we will have a lively conversation when I finish reading. Love that sweater! I recently finished A Tree Grows in Brooklyn and am glad to have finally read it. Nice socks, too. 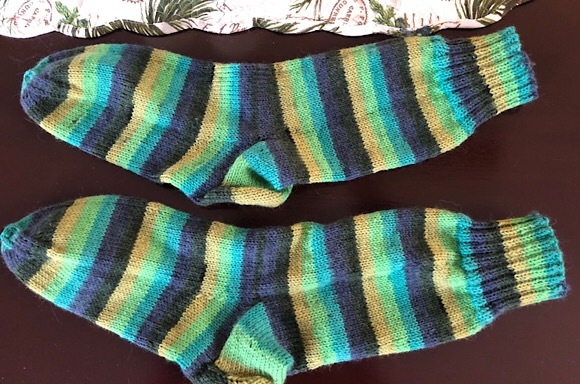 Hooray for finished socks! I think we've still got plenty of cold left in winter, so they will keep your husband's feet nice and warm. The sun does show your blanket off, and I love that sweater. 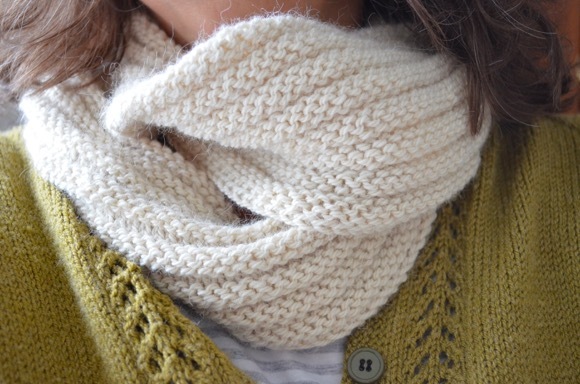 Enjoy your knitting time on these lovely projects! I read People of the Book by Geraldine Brooks and really loved it! I have added this book to my queue! And, that sweater... so gorgeous! Knitting: Sunday Swing Socks, Honey Badger Socks, Longing for Spring Socks and my two scrappy blankets. I love your projects. Those socks are so pretty. It is hard to photograph a dark afghan. I like the texture of it. 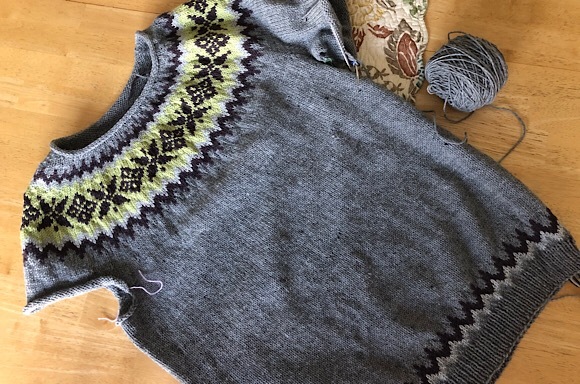 Can't wait to see that gorgeous sweater when it is finished. The sock are great! I only made it half way through the The Great Alone. I had to turn it back into the library. I wasn’t completely hooked with the story. I’m not sure if I’ll finish it. i absolutely love that sweater! i am literally on the last few rows of Danikas cardigan. It was supposed to have been a gift for her for christmas but i ran out of wool on the last sleeve. I think it may be because i add a few more inches to the body so that it would be a little longer. Anyway, I had to wait for my supplier to order in for that colour and it only arrived on the weekend. I am excited about finally getting it done. I don't knit, but I am crocheting. I'm on the last ten rows of a baby afghan. Then of course, there is the edging to do. :) I'm currently not reading anything. That afghan you are making for your son is beautiful, Karen! Love, love, love your sweater. So gorgeous. And those socks are so fun - great colors. What pattern are you using for the blanket? Colin wants me to knit one for him. I started The Great Alone but just didn't like it - ended up returning the e-book. Too many books I really WANT to read to spend time on one that I'm not enjoying. Luv the socks. I have green yarn set aside for socks this year too. 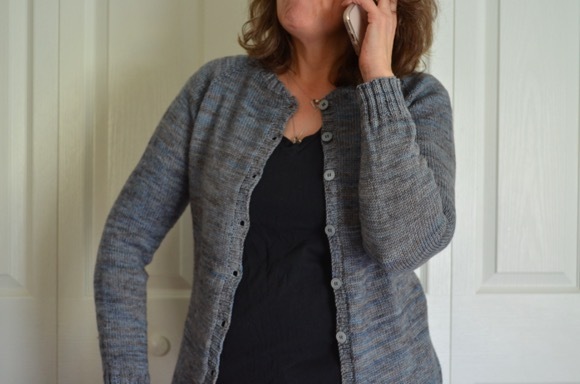 Your son's afghan looks great. I'm hoping to begin an afghan this year. The sweater is just gorgeous! Can't wait to see it done! Congrats on finishing the socks & your sweater body! The blanket is coming along nicely. 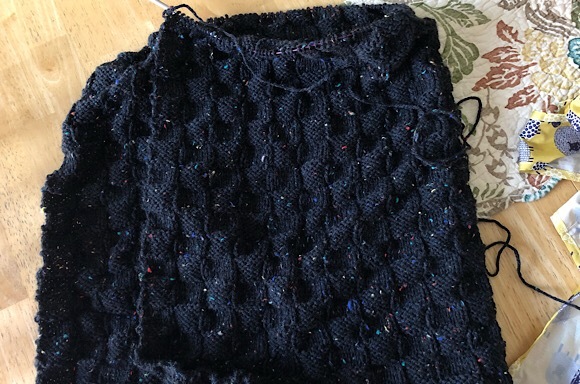 Love the tiny blips of color in the black yarn. Geraldine Brooks is a wonderful author. I bet your husband will get plenty of wear out of those socks yet this winter. We have snow falling this evening. I finished two projects so have cast on a little sweater for my granddaughter and a birthday hat for my daughter-in-law. Knitting slippers for ME! I LOVE THOSE SOCKS! Your wonderful, knitting progress puts mine to shame. I need to schedule in some knitting time. I miss it.